Generally, we use public water to change the tank water (remember that a 25% water change is recommended… no more). The water from your public company can be your friend or your enemy. As a discus aquarium owner, you really need to invest in a few tools to assist you in keeping your fish alive and healthy. One of those is a testing kit. They are available at any fish supply store or online. Many water suppliers add chlorine or chloramine as a matter of routine in order to make the water drinkable for humans. Do you know if your water supply has been treated with these chemicals? A simple color test kit will determine the presence and concentration of either. If your water does contain chlorine or chloramine, the removal of these water additives should be part of the water conditioning process before you use it to replace the water in your tank. You can remove chlorine from your public water by using an activated carbon pre-filter system. You can remove chlorine by “aging” the water or using a sprayer that mists the water in the air. There are commercial chlorine removers that can be purchased at your local fish store. Use reverse osmosis filters to remove the chlorine, but be warned that there are other chemicals and minerals that are necessary for your discus that will need to be replenished after running your water through a reverse osmosis filter. Water companies also use chloramine additive to disinfect public water for consumption. If you think chlorine is bad for discus, chloramine is much more destructive. If your pretest shows that there is chloramine in the water supply, the good news is that there are chemicals to neutralize the harmful effects. When buying the chemicals for conditioning your water, be sure to purchase one that is specific to chloramine. Aging and aeration will not do the trick on this one. 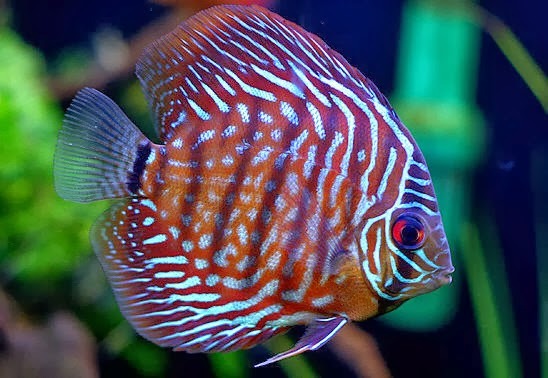 Changing out your discus fish water should be done no less than once per week, and using good water that is safe for your fish is really important. In fact it is the one thing that will add life and happiness to your discus fish above all others.